Mrs. Iris Henry, former Education, Women and Children’s Ministries Director of West Indies Union Conference (WIU), now Jamaica Union Conference (JAMU) has died. Mrs. Henry went to sleep on Sunday, March 10, 2019, after years of illness. She was 82. Born February 27, 1937, “Sunshine” as she was affectionately called because of her radiant and winsome smile, has given more than 45 years of service to the Adventist Church in Jamaica after starting her work with the Organization in March 1960 as a Secretary at West Indies College, now Northern Caribbean University (NCU). 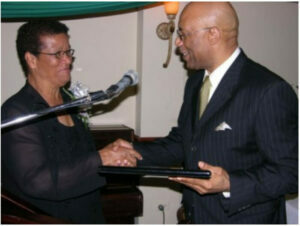 She then went on to serve as Head Teacher and Acting Principal in the West and Central Jamaica Conferences. 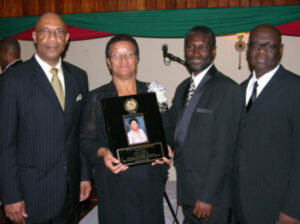 Former President of West Indies Union Conference of Seventh-day Adventists, Pastor Patrick Allen, presents a plaque to Mrs. Iris Henry for 45 years of service to West Indies Union Conference (File Photo December 22, 2005). After serving in various capacities at West Indies College and further studies at the University of the West indies, Henry accepted a call to serve at WIU in 1994 as the Education Director. She also served as Director of Women and Children’s Ministries before retiring January 2006. 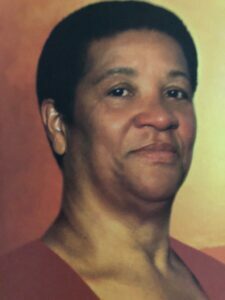 “We use this medium to remind the members of her family that they are in our prayers as they cope with Sister Henry’s passing,” Brown further stated. The Service of Thanksgiving for the life of Iris Henry will be held at the NCU Gymnatorium in Mandeville on Sunday, April 7, 2019 at 10:00 am. Her body will be interred in her parish of birth, St. Elizabeth. I am praying for the family. Rest in Peace Mrs. Henry. You have been faithful. Jesus is coming soon! My sincere condolences to the Henry family during this time of bereavement and loss. Mrs Henry was one of my many mentors when I worked at WIC. She would come to my office and pointed out little things that I needed to do to improve my efficiency as a young Secretary at that time. I am forever grateful for her kindness. May her soul rest in peace as we all await the return of the Lifegiver where there will be no more death and no more parting.